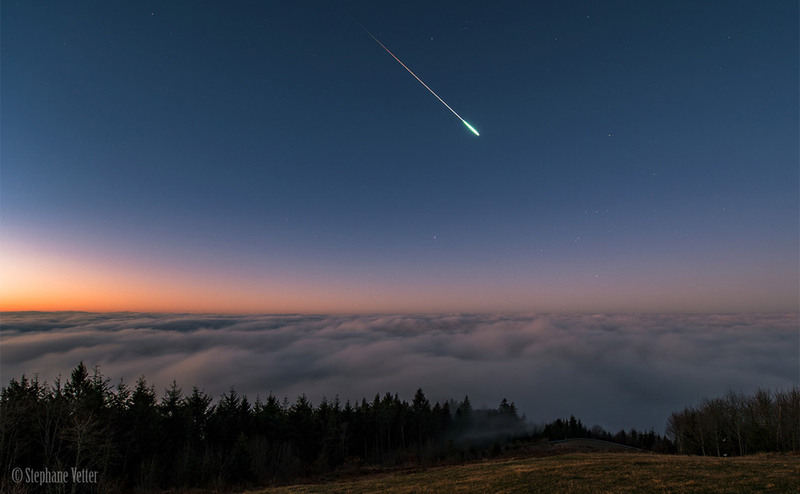 The AMS has received over 575 reports so far about of a bright ireball seen above the Northern West Coast area on January 9th, 2019 around 6:35am EST (11:35 Universal Time). 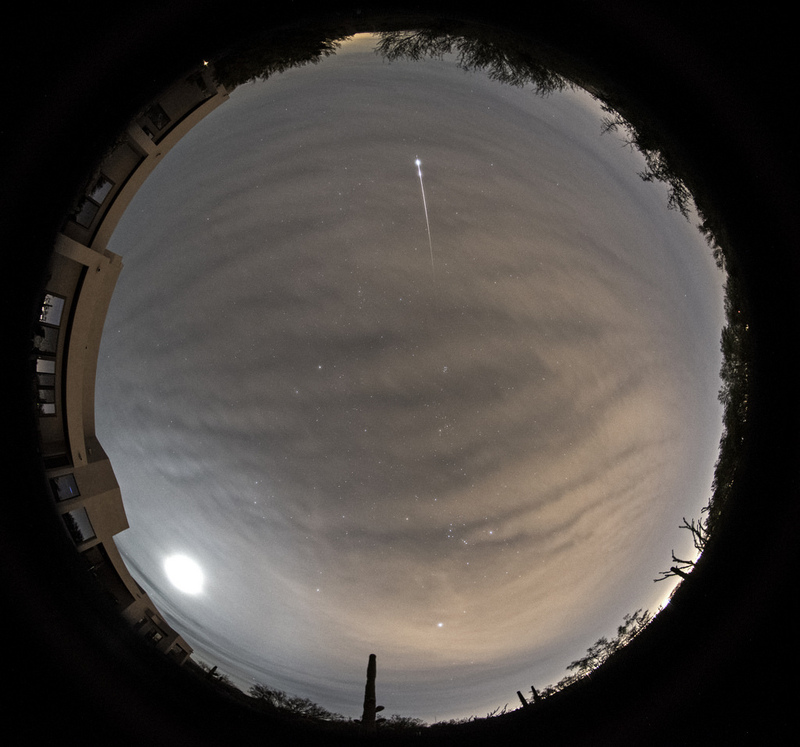 The event was seen from Connecticut to North Carolina. 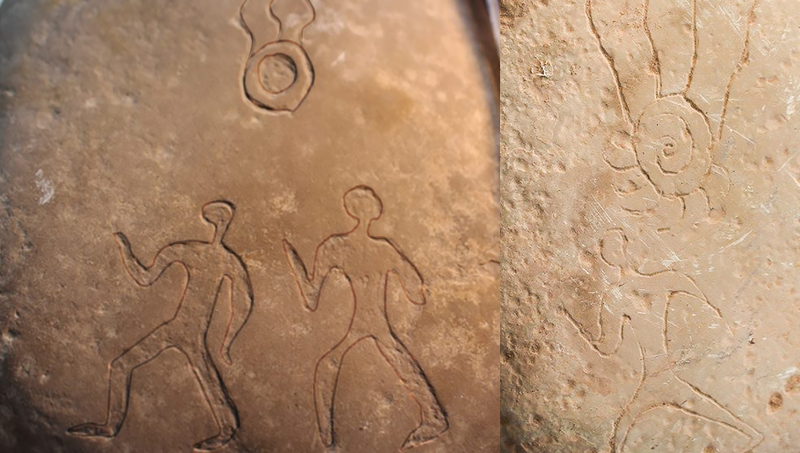 Five Moroccan researchers discovered petroglyphs of what it looks like meteors falling to Earth, suggesting that ancient Moroccans had witnessed meteorite falls. During this period the moon will reach its last quarter phase on Saturday December 29th. At this time the half-illuminated moon will rise near midnight local standard time and will remain above the horizon the remainder of the night. Under these conditions successful meteor sessions can be held as long as you face away from the moon. 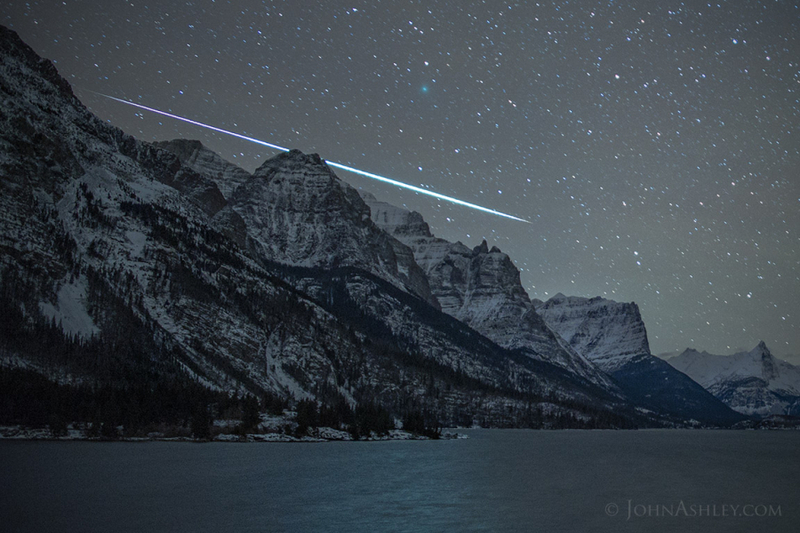 The Earth encounters Quadrantid meteors from December 22 through January 17. Rates are extremely low away from the January 4 maximum. 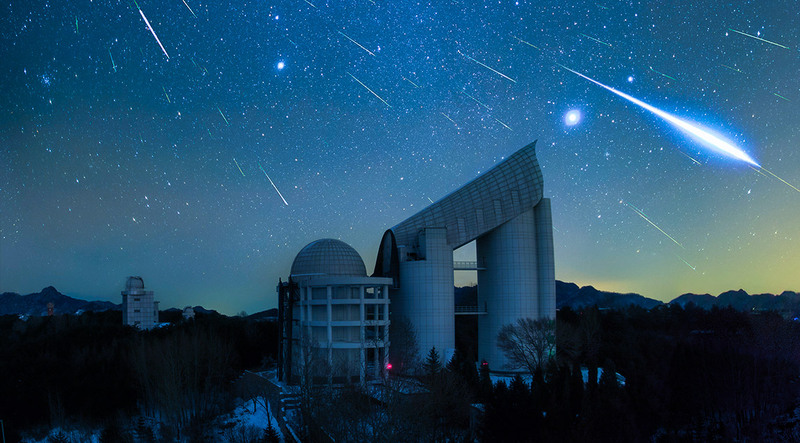 For 2019, the maximum is expected to occur near 02:30 Universal Time (UT) on January 4. During this period the moon will reach its full phase on Saturday December 22nd. At this time the moon will lie above the horizon all night long for observers in the northern hemisphere. This will make viewing meteor activity difficult at the very least. 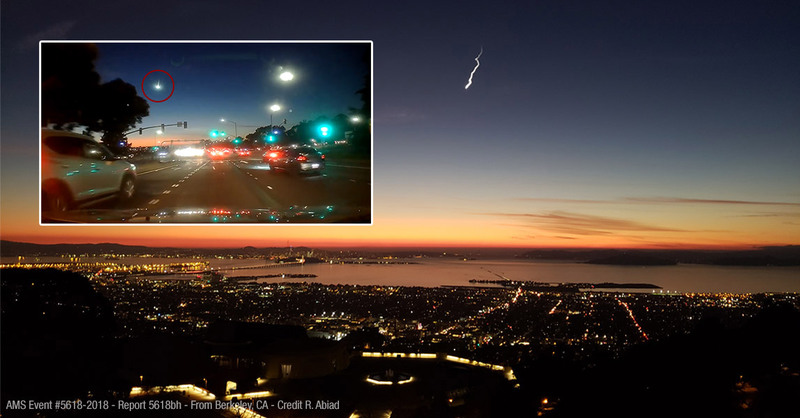 The AMS has received over 120 reports so far about of a fireball seen above the San Francisco area on December 19th, 2018 around 5:35am PST (Nov. 20th 01:35 Universal Time). 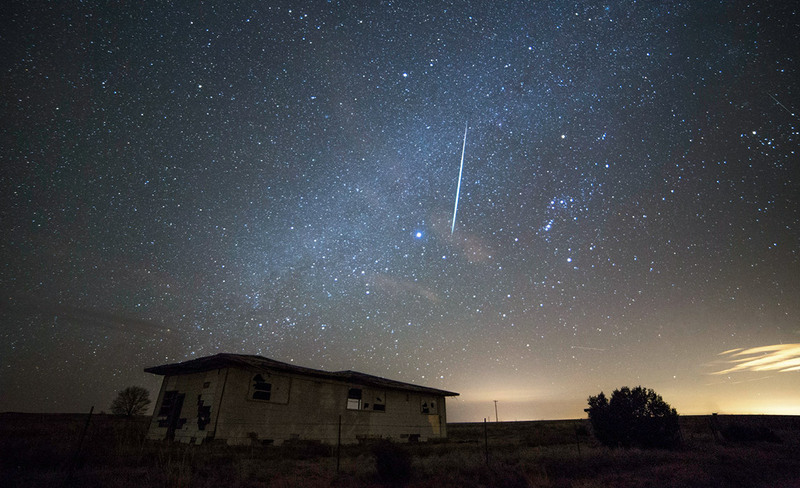 The event was seen primarily from Northern California but was also seen from Nevada and Oregon. During this period the moon will reach its first quarter phase on Saturday December 15th. At this time the half-illuminated moon will set between 11-12am local standard time for observers in mid-northern latitudes. 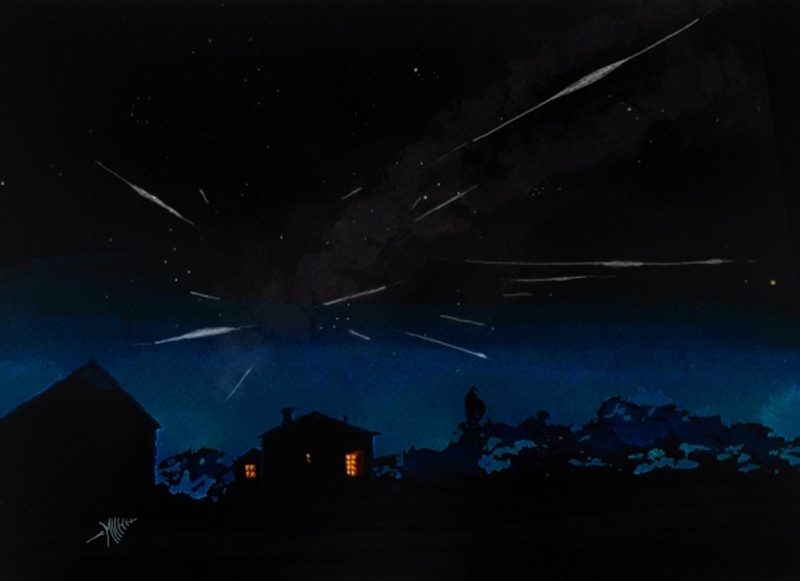 This will compromise evening observations of meteors but the more active morning hours will be unaffected. As the week progresses the waxing gibbous moon will set later and later, limiting the time of truly dark sky to the hours just before dawn. During this period the moon will wax from a slender crescent phase to nearly half illuminated. 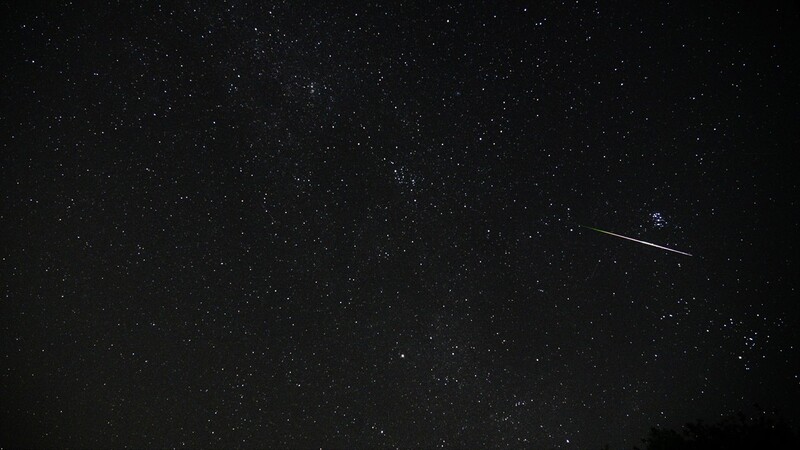 This will be a great time to view meteor activity as the moon will have set by the time the more active morning hours arrive. 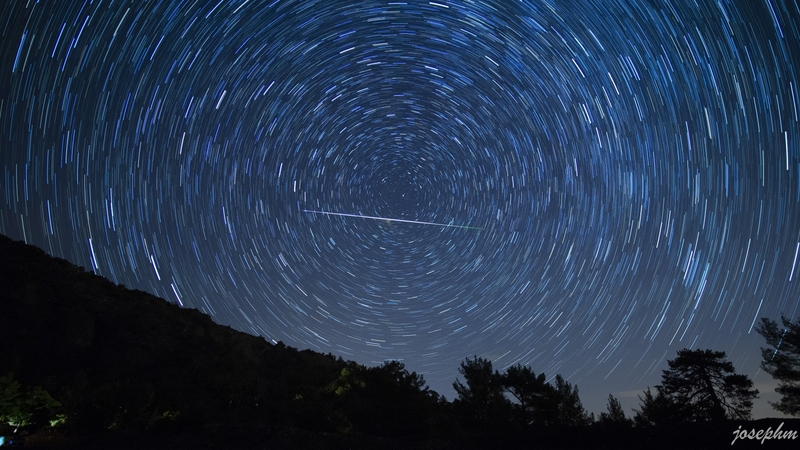 The moon will be present during the evening hours but successful meteor observing is still possible during this time by simply keeping the moon out of your field of view. 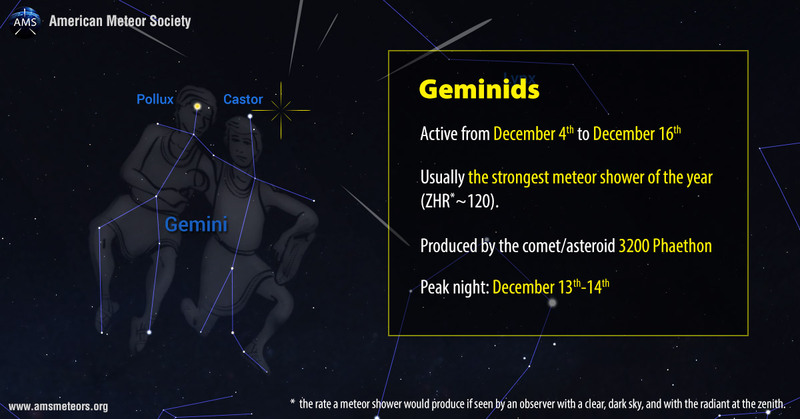 Year in and year out the Geminids are currently the most dependable meteor shower. Unfortunately, they are active in December when temperatures are often cold and skies cloudy in the northern hemisphere. If this shower peaked in August it would be much more popular, but the radiant would then lie much closer to the sun and Geminid meteors would only be visible in the few hours preceding dawn. During this period the moon will reach its new phase on Friday December 7th. At this time the moon will be located near the sun and will be invisible at night. 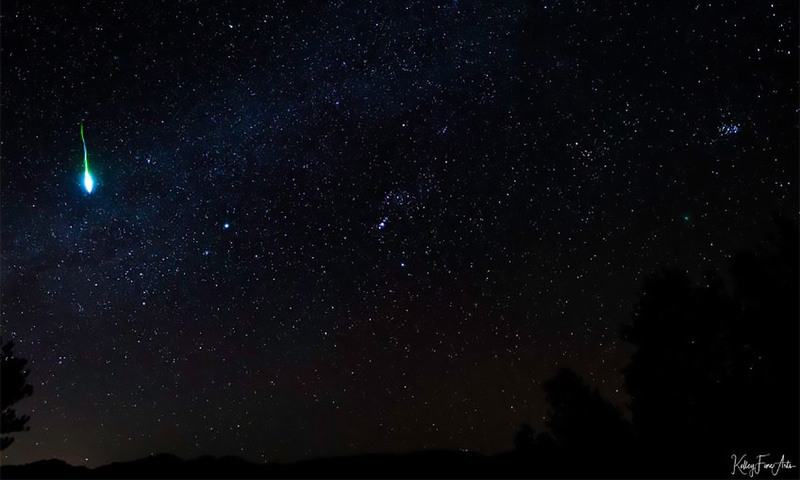 This weekend the waning crescent moon will rise during the early morning hours but successful meteor observing is still possible by simply keeping the moon out of your field of view. 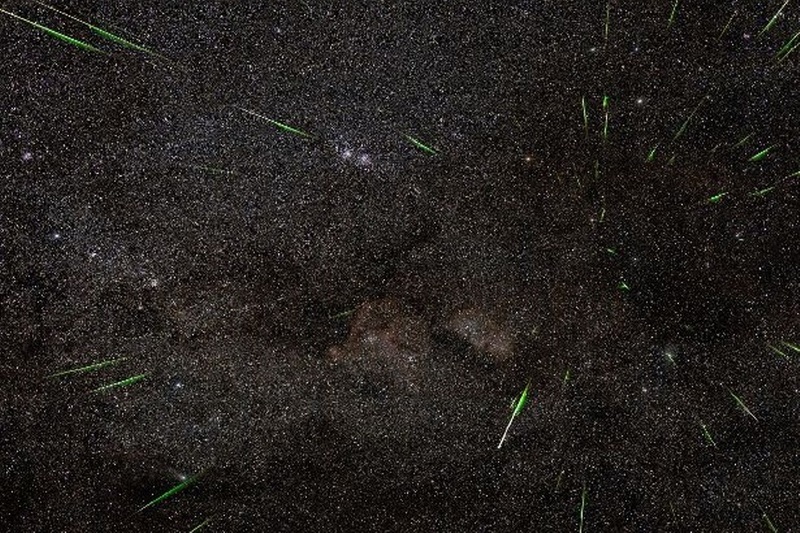 Outburst of the Andromedids in 2018? 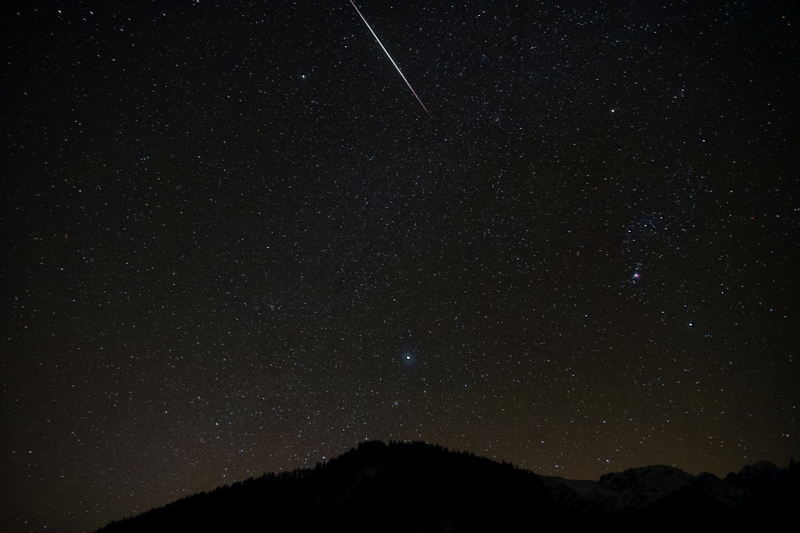 During the period of December 3-5 2011, the Canadian Meteor Orbit Radar installation observed strong activity from a source on the Andromeda/Cassiopeia border. 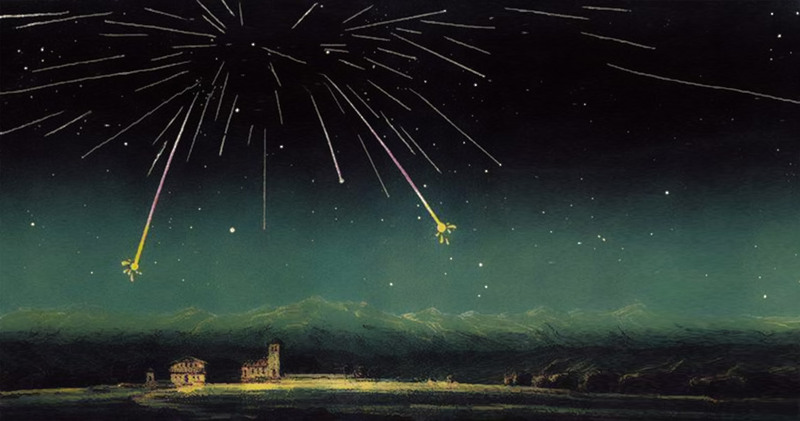 After a lengthy analysis it was determined that these meteors were produced by Comet 3D/Biela during its passage though the inner solar system in 1649. This is the same comet that produced the magnificent Andromedid displays of 1872 and 1885. During this period the moon will reach its last quarter phase on Thursday November 29th. At this time the moon will be located 90 degrees west of the sun and will rise near midnight local standard time. This weekend the waning gibbous moon will rise shortly after dusk making it difficult to view meteor activity the remainder of the night. During this period the moon will reach its full phase on Friday November 23rd. At this time the moon will be located opposite the sun and will lie above the horizon all night long. This weekend the waxing gibbous moon will set during the early morning hours allowing a few hours of observations before the start of morning twilight. 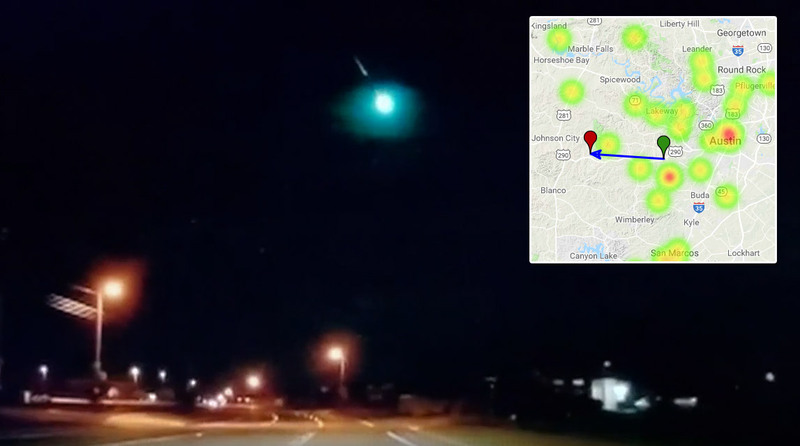 The AMS has received over 95 reports so far about of a fireball event seen above Texas on November 15th, 2018 around 21:25am CDT (November 16th 3:25 Universal Time). 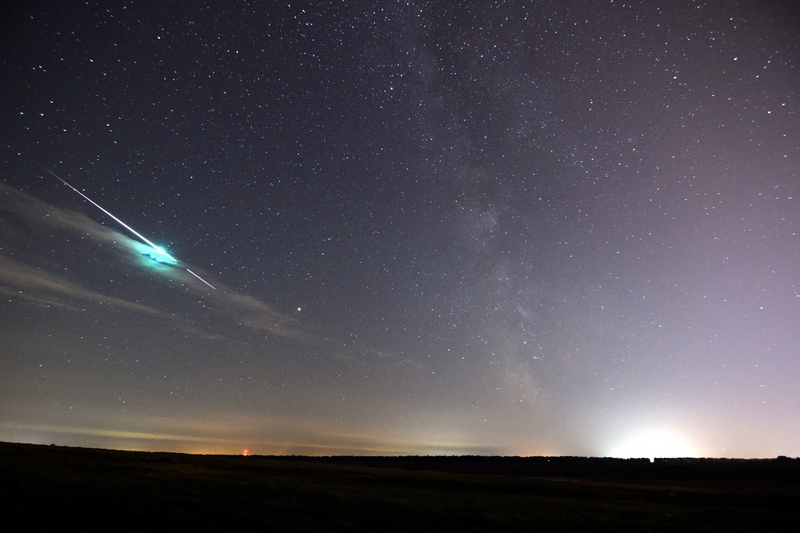 The fireball was seen primarily from Texas but was also seen from Louisiana and Oklahoma. During this period the moon will reach its first quarter phase on Thursday November 15th. At this time the half-illuminated moon will be located in the early evening sky and will set near midnight local standard time (LST). This weekend the waxing crescent moon will set during the early evening hours allowing meteor observations under perfect conditions during the more active morning hours. 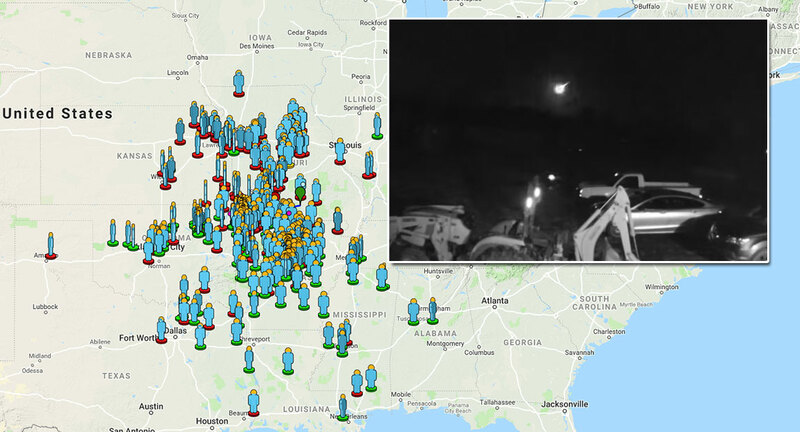 The AMS has received over 375 reports so far about of a fireball event seen above Missouri on November 2nd, 2018 around 7:25pm CDT (November 3rd 00:25 Universal Time). 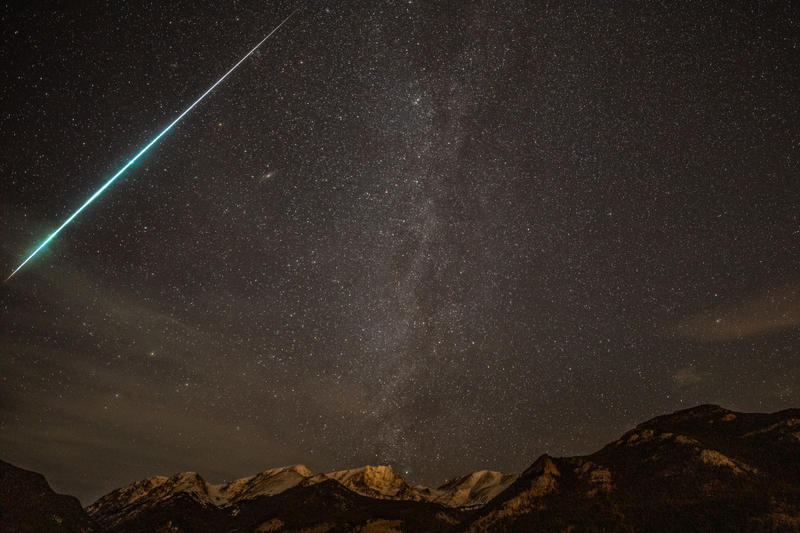 The fireball was seen primarily from Missouri but was also seen from Alabama, Arkansas, Illinois, Indiana, Kansas, Kentucky, Louisiana, Mississippi, Oklahoma, Tennessee and Texas. During this period the moon will reach its new phase on Wednesday November 7th. At this time the moon will be located near the sun and will be invisible at night. This weekend the waning crescent moon will rise during the early morning hours but will not cause any problems viewing meteors as long as you keep it out of your field of view. During this period the moon will reach its last quarter phase on Wednesday October 31st. At this time the moon will be located 90 degrees west of the sun and will rise between 2200 and 2300 local daylight saving time (DST). This weekend the bright waning gibbous moon will rise during the early evening hours and will spoil the remainder of the night by obscuring all but the brighter meteors. The estimated total hourly meteor rates for evening observers this week is near 3 for those viewing from the northern hemisphere and 2 for those located south of the equator. For morning observers the estimated total hourly rates should be near 18 as seen from mid-northern latitudes and 13 from the southern tropics. Rates are reduced during this period due to moonlight. During this period the moon will reach its new phase on Tuesday October 16th. At this time the moon will be located 90 degrees east of the sun and will set near midnight local daylight saving time (DST). This weekend the waxing crescent moon will set during the late evening hours leaving the remainder of the night nice and dark for meteor observing.